THE travails of Messrs Abdullahi Sambo and Waziri Bintube at Nigerian Bulk Electricity Trading Plc (NBET) began in June 2017 after the former wrote to the Ministry of Power, Works, and Housing challenging his redeployment in the company. Sambo maintains that his redeployment and subsequent predicament at NBET is not unconnected with his whistle-blowing on the MD/CEO of NBET, Dr Marilyn Amobi, whom he accuses of mismanagement and misappropriation of funds. Mr. Bintube, who is an official in the finance department, co-authored the petition against the MD. In a letter dated June 13, 2017, and addressed to Abdullahi Sambo, NBET management led by Amobi announced an organisational shakeup that culminated in the redeployment of Sambo from (Head) Internal Audit Unit to Project, Research and Peoples Development Department on his extant salary grade level. In the letter signed by NBET’s Head of Corporate Services, Itohan Ehiede, management noted that Sambo’s redeployment was part of “the organisational human capital plan” and based on the need to enhance the company’s internal capabilities. Sambo was directed to report to the GM, Project, Research and Peoples Development Department who will advise him on his functions accordingly. A week earlier, the Office of the Accountant General of the Federation had written to NBET to inform the organisation that one Hauwa Bello will resume to the Internal Audit Unit. On receipt of the redeployment letter, Sambo said he wrote a petition to Babatunde Fashola, the Minister of Power, Works, and Housing as the Ministry exercised a supervisory role over NBET in the absence of a board. Sambo in his petition called on Fashola to avert “another crisis in NBET”. He argued that his redeployment and the organisational reshuffling was orchestrated by Mrs. Amobi without due recourse to the board (or Ministry). “As you know, your redeployment became necessary following an organisational refinement that was made to accommodate the Treasury Accountants the Head of Service of the Federation approved to be deployed to NBET, pursuant to the request that NBET made in 2012 to the Office of Account General of the Federation (OAGF) for grant of self-serving status, as provided for in the Financial Regulations (Revised Edition, 2009), Government Notice No. 291. NBET management accordingly concluded that Sambo had become redundant: “Since June 2017 that you have refused to accept your redeployment, you have become redundant, yet you earned the total sum of N11,272,505.07; whilst the organisation spent N1,355,959 only, for fuelling and maintaining a project vehicle that you use,” a letter to him read. In her submission to the Committee, Amobi accused Sambo of refusing to be deployed within the company, withheld the audit stamps and locked up the security safe of the company leading a stoppage of his salary and other emoluments. On the other hand, she alleged that Bintube proceeded on leave without authorisation and failing to respond to a query within 48 hours which was then deemed as resignation. Meanwhile in a letter to the Minister of Power, Works, and Housing informing him of their arrest, the duo alleged that, police officers from the Special Protection Unit were deployed to the premises of NBET and were harassing staff of the organisation. On the 3rd of September 2018, Sambo wrote a letter to Mrs. Amobi, urging her to “avert the economic, social and psychological injustices” being meted out on him. Abdullahi Sambo courted more trouble after he featured in the popular brekete familybroadcast on Human Rights Radio 101.1 Fm on 2nd November, 2018 during which he spoke on his running battle with Marilyn Amobi. “Furthermore you discussed the contents of several internal communication that you alleged exists in the organisation,” the query noted. “Furthermore, given the reputational damage that you caused the company, kindly within the next forty-eight hours provide compellingreasons onn why appropriate disciplinary actions should not be taken against you in line with the Human Policy Manual of NBET and the Public Service Rules,” the letter concluded. However, a week after, Sambo received communication on the decision of the Hearing Committee which found him guilty of disclosing sensitive and confidential information that negatively affected the image of the organisation and amounted to gross misconduct. The committee, therefore, recommended his summary dismissal. The recommendation of the committee was approved by the management. However, the African Centre for Media and Information Literacy (AFRICMIL) has taken up the case of Sambo and Bintube. The organisation’s whose work includes the protection of whistle-blowers recently wrote the MD/CEO of NBET to furnish it with evidence of implementation of the directive of the Ministry of Power, Works, Housing to reinstate the salary and emoluments of Sambo and Bintube. “We appeal to you, Sir, to act faithfully to resolve this matter once and for all in the absence of any known Board. In the interest of justice, and in the interest of reversing the old and appalling ways of conducting public affairs which this administration promised the Nigerian people, we humbly request you to direct Dr. Amobi to comply with the directives of the Ministry of Power, Works, and Housing as contained in the letters dated January 22, 2018, and February 6, 2018, and addressed to her,” AFRICMIL said in its letter of January 30, 2019. According to Ighomrore, “Most of the things you have raised are internal processes issues. NBET as an organisation has a process manual, so if there are internal issues they will be dealt with internally. I am not sure if the day to day work of staff is what should make front page news. This report was put together by Leaks.NG, a coalition of news and civil society organisations, which provide a platform for Nigerians to submit evidence of wrongdoing by public office holders in Nigeria. 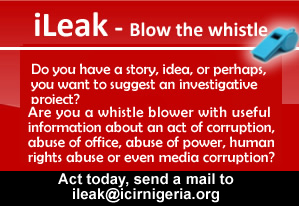 To make a submission, please go to Leaks.NG and follow the simple steps involved.